Need a Valentine’s Day idea? 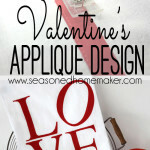 Since you know I love me some applique I’ve put together a fun tutorial that includes a Valentine’s Day idea, appliqué. 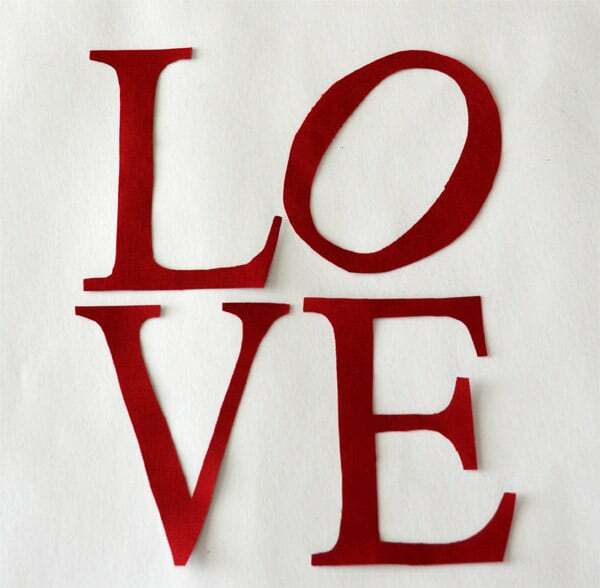 Are you familiar with the Love Sculpture by Robert Indiana? It sits in Love Park in Philadelphia. And, the Love Sculpture is one of my favorite pieces of urban sculpture. 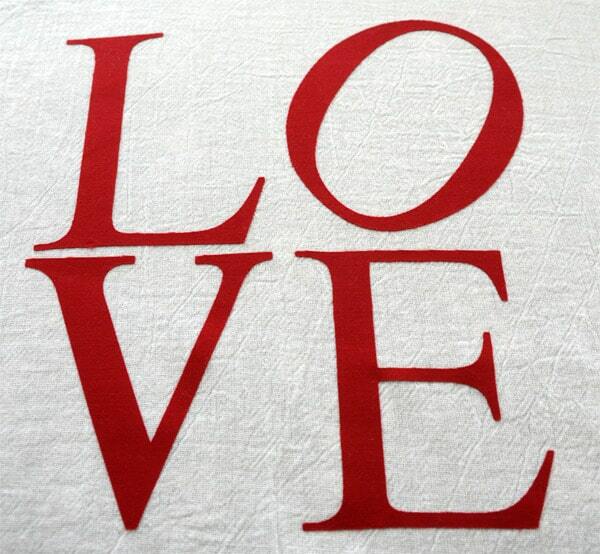 Wouldn’t the Love Sculpture lettering look awesome appliqued on a kitchen towel? Can you see it hanging in your kitchen? Me, too. 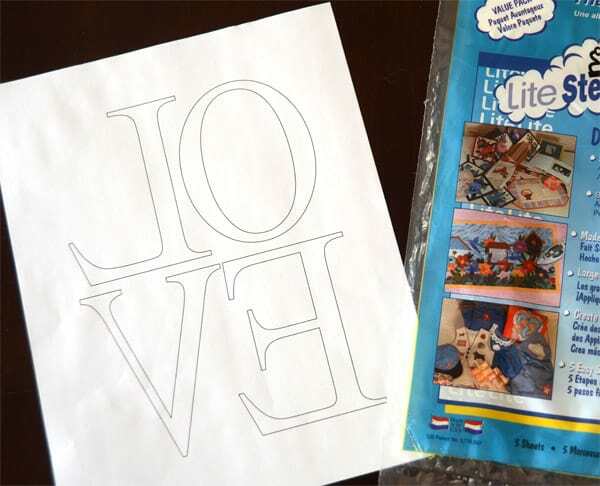 Download and print the LOVE pdf with the reversed applique letters. Lay the fusible web OVER the pdf that you’ve just printed. Trace each of the REVERSED letters onto the paper side of the fusible web. The ‘O’ isn’t reversed. 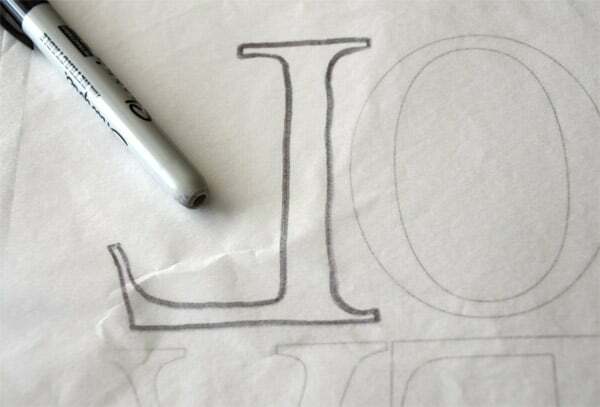 Rough cut around each letter that you’ve just traced. NOTE: You do not need to precisely cut each letter until all of the letters have been fused to the back of your fabric. 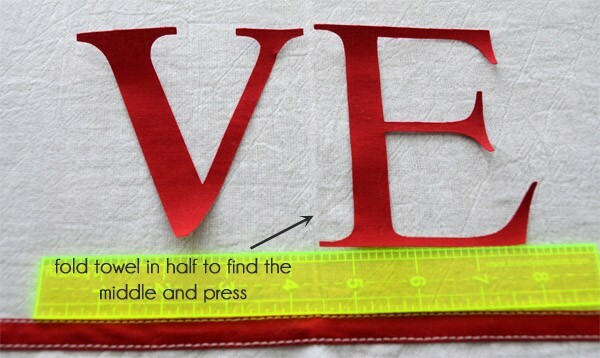 Fuse the letters to the back of your fabric according to the product’s directions. 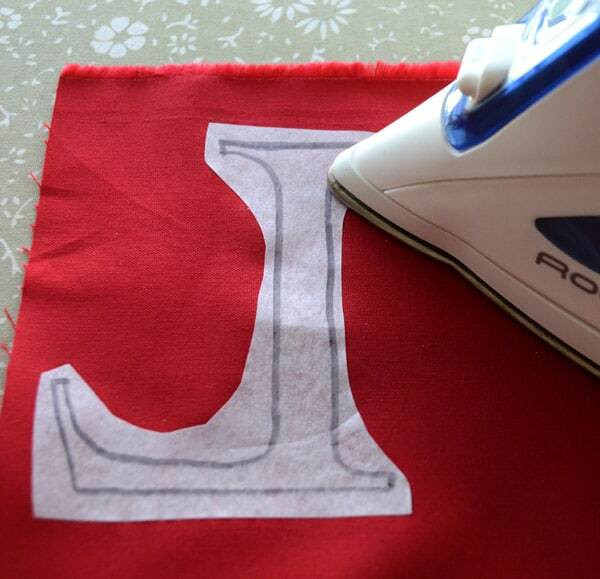 Be careful not to get any of the fusible web on your iron – the letters tend to curl at the edges. Precisely cut out the letters on the lines you have drawn and set them aside. 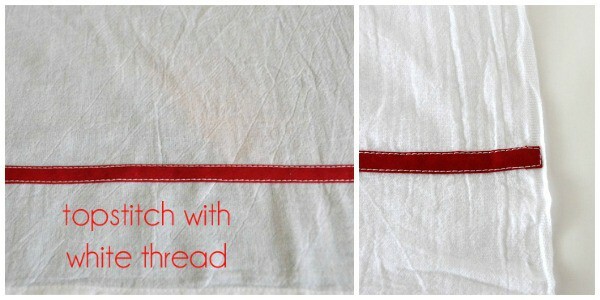 Add a piece of red bias tape 3″ from the bottom edge of your kitchen towel. Pin to hold. Topstitch with white thread on both edges of the bias tape. 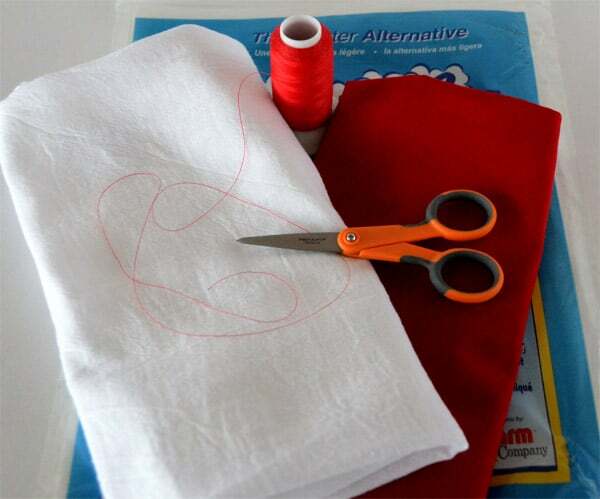 Fold under the bias tape at the sides of the towel. Next, line up the “L” above the “V”, but don’t fuse it to the towel, yet. Because the “O” is slanted, it is the last letter you want to place on the towel. You will need to work with it a little to get it exactly right. Once the “L” and the “O” are lined up, press them with a hot iron to fuse. With matching thread, straight stitch carefully around each letter. 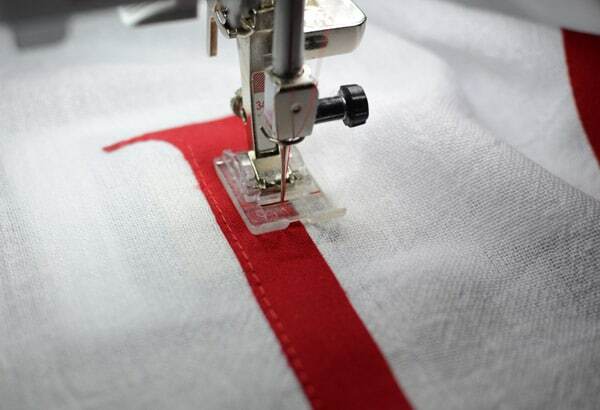 Really take your time with the top stitching. Stitch just inside the cut edge. Use white thread in the bobbin for a clean back on the towel. I made a second towel to see how this design would work on a thicker, textured towel. I used an inexpensive Ikea waffle-weave towel. If you use a textured towel, watch out for the puckers when you attach your lettering. It was a little tricky ~ but totally doable. I left the bias tape off of this towel ~ it was just too much with the textured pattern. The design really stands out against a stainless steel dishwasher and I love how it adds a pop of style to my kitchen. For the Silhouette, I ironed the fusible web to the back of my fabric prior to putting it into the machine. It cut beautifully on the “Fabric Cotton Print” set at #3. 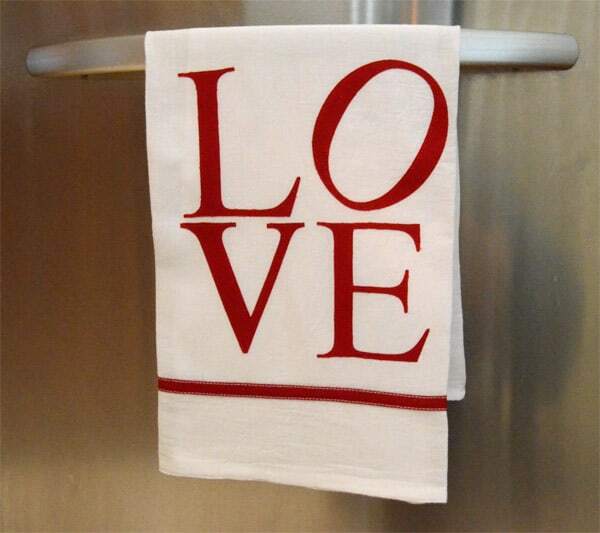 Either way, make a few LOVE Applique Towels and share some love this Valentine’s Day. It is simple ~ and easy! Thanks! It would be my pleasure! Thanks for your lovely comments! One was made with a vinyl cutter and one was not. I wanted both options available. The towels look great! I love the lettering the how you used the bias tape. Thanks! It’s really a fun project. This is SO cute! I am definitely going to be a copy cat & make this! I made it to spread the LOVE! Your tea towels are so pretty! A onesie is a great idea ~ you might need to resize the lettering in the software. I used WonderUnder on my fabric – not the Silhouette product. Their fabric fusing product is very heavy and would be too stiff on a onesie. Both towels took the same amount of time – one on the Silhouette, the other done by hand. Either works great. 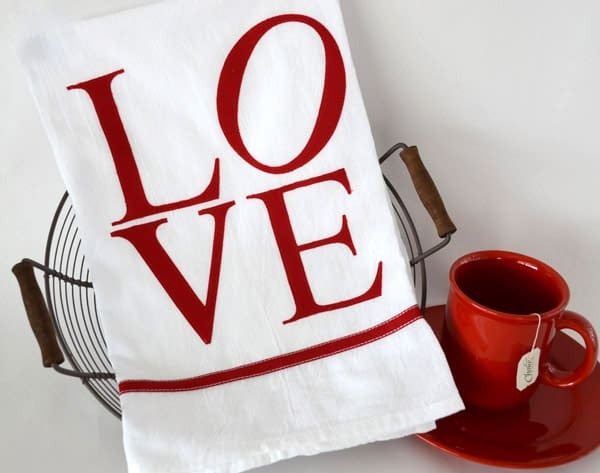 Thank you so much for visiting Homa Style and linking your Valentine LOVE towels. That is an awesome towel and a great tutorial! I’m glad you like it. This is one of my favorite designs. So cute – love the red on white. These are beautiful. Love it! I love to sew and I am pinning this for my next project. We love it and we LOVE IT! We really, really do and we have invited everyone on Facebook to sew up a bunch and give them away so they will have bunches of Valentines for that special day!! One can only hope – HA! We are so excited that you’ve joined us on Simply BeBetsy – thanks so much – we are having a lot of fun with it. Take care. Love it 🙂 Would look great on a table runner too, simple and yet such a big impact. I see a silhouette project in my future! This is so cute! I’ve used this product before and might even have some of it stashed away somewhere. 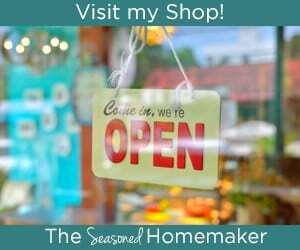 Maybe I should make one…..
I’m visiting from Creativity Unleashed. It’s nice to meet you! These are lovely! Thanks for the great instructions! So cute! I’ll be pinning this to try sometime. Thanks for sharing at the Weekend Wind-Down party, be sure to link back to us so that you can be featured! This is adorable! The red letters look very striking on the white towel. Great job! Your towel is so pretty. I love the design and how you incorporated it into your sewing project. Pinning! Love this! Excited to try this with words and shapes. Awesome tutorial… Thank you! 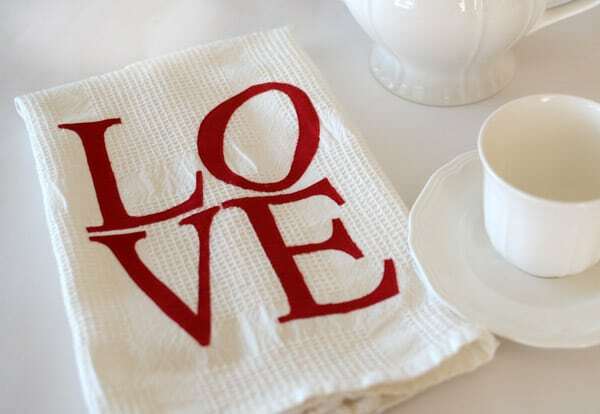 I just LOVE this love towel and thank you for the step-by-step instructions on how to make one. This is really sweet – I recognized your inspiration! I like the boldness of the letters – it makes the design crisp and modern. I’ve pinned this! What a cute idea! 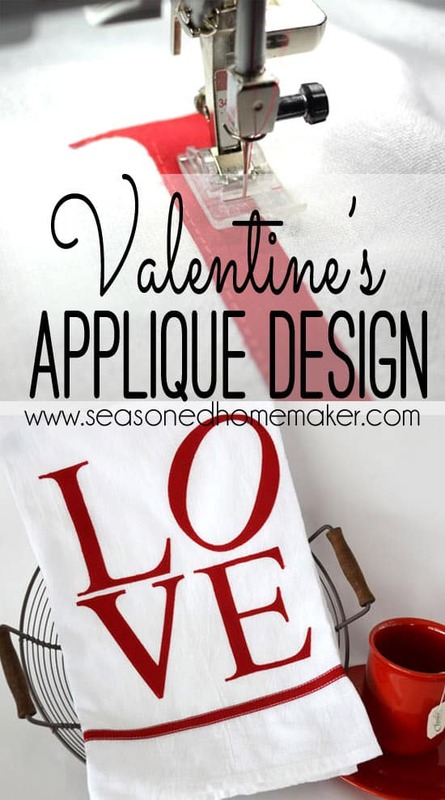 Not just for Valentine’s Day, but any time family is coming over for dinner or coming in from out of town. Thanks for sharing! You’re right ~ it doesn’t have to be for Valentine’s Day only. I love this!!! The red lettering on the white towel looks great! Stopping by from Hoyby Crafts courtesy of the Skip to My Lou link party. I LOVE this sewing project! It’s fun to see where the inspiration came from too. Great project! We have one of those statues here in Phoenix too 🙂 Thank you so much for linking up with Get Your DIY On in Feb. Thank you for the wonderful idea. This has been one of my favorite designs forever. I have some sewing I need to do this week I think this project has been added to my list. I Love the towel. Thanks so much for the great tutorial and the download. What a neat project! Where can I get other letters for additional projects? I suggest you check the fonts on your computer. After that, I love Dafont.com for free fonts. Love it! How do you keep the red from running when washing? 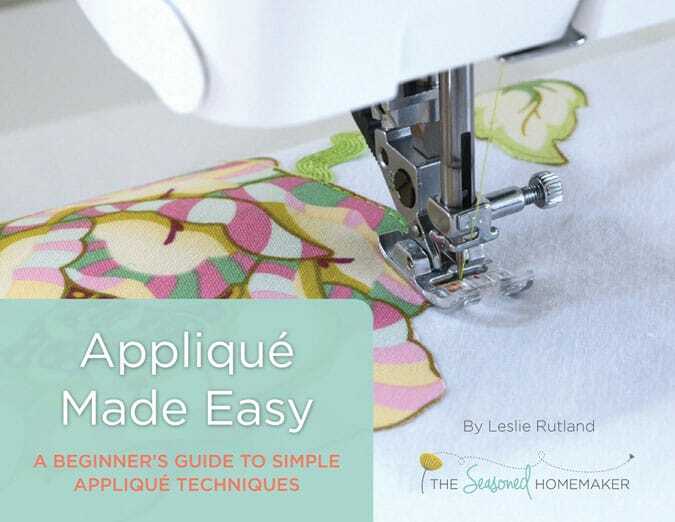 This is such a great project and your tutorial is excellent…easy to understand and thorough. Thanks for sharing! Leslie, can I ask where you buy your flour sack towels? I can’t seem to find towels that are a good weight. Any suggestions? I love your ideas for everything! I get the Aunt Martha brand at Joann’s or Hobby Lobby. But, Target has them,too. Inspired by yours….digitized mine. Fun. Easy.